Ward’s Digital Slides Powered by Motic® Hand-Prepared Quality Meets Digital Innovation Introducing the first and only digital slides collection of its kind, available at an affordable price for middle school, high school, and introductory college levels. 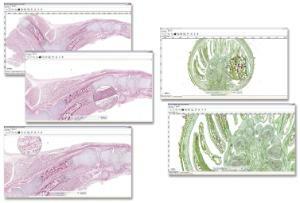 Ward’s Digital Slides enhance traditional biology and microscopy labs through deeper analysis of specimens and structures, customized specimen interaction, and increased user control with every slide. Scanned by Revolutionary Motic® Technology Our vast collection of hand-prepared microscope slides has been digitally scanned by Motic®, the leaders in digital microscopy technology. This exclusive 3D scanning process captures specimen images at multiple magnifications and depths of field. The result is a crisp, high-resolution digital image that clearly depicts intricate details of structures at every level. Aligned with Common Science Standards Complete digital slides libraries are organized by curriculum topic, and aligned with common science standards and popular college textbooks. Complete Digital Slides Database at Your Fingertips Choose your Ward’s Digital Slides set and enjoy access to a full library of slides organized by curriculum topic. Measure structures on screen, navigate within thumbnails, delineate regions of interest, and capture images for further study. Exclusive Imaging Software Enables Customized Interaction Ward’s Digital Slides Image Interface by Motic® allows you to view, annotate, and save captured images from your slides library. Use to customize your lessons and presentations to suit your teaching needs, deepen student understanding, enhance student assessments, and much more. With Ward’s Digital Slides you can: Zoom up to 1000xMeasure structures on screen Navigate within layers of specimen along X, Y, and fine-focus Z-stacked axis Adjust fine focus of thick specimens along the Z-stacked axis captured by exclusive Motic 3D scanning process Capture and save images for annotation and further study. This set of 102 slide images addresses all four Life Science content standards and at least five sub-standards as outlined by the National Academy of Science Standards for high school and middle school grade levels. All of the slide images contained in the Ward's Digital Slides Middle School Life Science Set are included, plus an additional 51 slides to expand topic coverage and deepen student analysis. Two slides are also included to specifically teach proper microscope use and technique. Subscription includes Ward's Digital Slides CD-ROM with access to download your Ward's Digital Slides library and image viewing software. Step-by-step user guides and help files included on CD-ROM. Windows XP or higher operating system, Intel-based processor with 1GHz processor, 2GB RAM, 250MB hard disk space. Ordering information: Purchase is for 12 months of cloud access and can be renewed.